Specification: Material: Metal. Color: Silver. 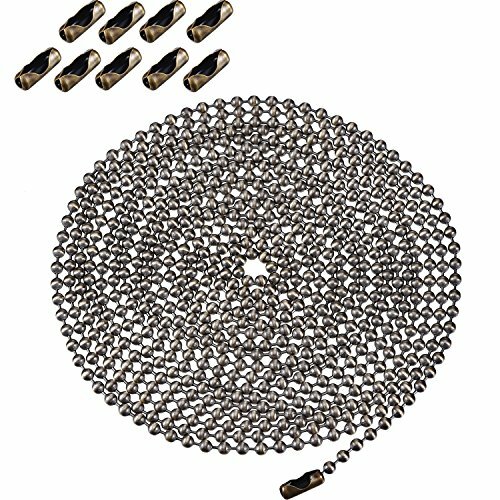 Dimensions: Diameter 3.2 mm / 1/8 inch, chain length 20 feet / 6 meters, with 20 mating connectors. Feature: Smooth surface,no burrs,comfortable to touch. Suitable for ceiling fan chains, high ceiling light fixtures, on the ceiling for ventilation, curtain zippers, bottle cap pendant necklaces,dog tag chain, key chains, necklace chain, and more. Easy to operate, adjustable length, just cut the required installation length. Package Content: 1 x 20 foot silver zipper extension. 20 connectors. 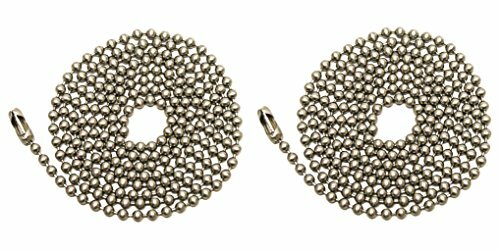 Note: This product is a 3.2mm bead chain; please make sure the replacement diameter of the ball size pull chain when buying. Small parts, please keep away from children. 2 Pack pull chain extension: Each bead pull chain is 3.3 feet/ 1 meter long, and with a cylindrical light pull, 2 styles of connectors that 3 pieces in total. Adjustable in length: Cut your desired length of pull chain to install on the places, which is convenient for your daily life. Application: Good for replacement for handle or extension pull chain. Well suit for ceiling light, ceiling fan, guyed desk lamp, etc. You can also use it just as decoration due to it looks shiny and solid, beautiful and stylish enough. Feature: Easy to fit, looks good. The hole is sufficient so that you can thread a light cord through it with little difficulty and there is room also for a triple knot. Detail size: The 3.3 feet/ 1 meter long chain has a bead diameter of 3 mm/ 1/ 8 inch. Cylindrical light pull size: 19 mm in length and 6 mm in diameter. Package includes: 2 x Pull chain extension 2 x Cylindrical light pull 6 x Connector Notice: Please make sure replacement diameter of balls size pull chain when you buy it. Small parts, please keep away from child. 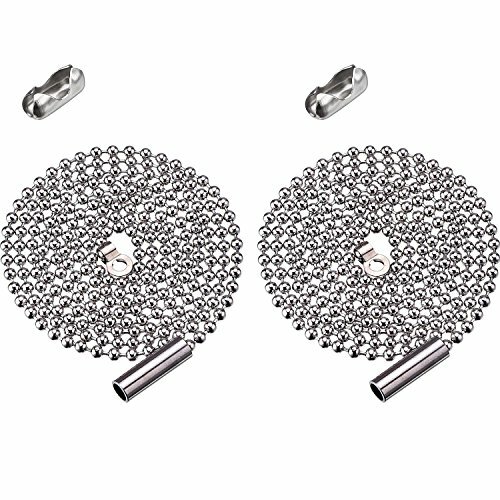 Specifications:Material: MetalColor: SilverSize: Diameter 3.2 mm/ 1/ 8 Inch, Chain Long 16 Feet/ 5 Meter, With 20 Pcs Matching ConnectorsFeatures:Round Beaded With Smooth Surface, With No Burrs, Comfortable In TouchCan Apply To Ceiling Fan Chain, High Ceiling Light Fixtures, On The Ceiling For Ventilation, Curtain Zippers And Dog Tags, Bottle Cap Pendant Necklaces, Spell Word Pendant Necklace And Other OccasionsEasy To Operate, Adjustable Length, Just Cut The Desired Length Of The Installation Can BePackage Includes:1 x 16Feet Silver Pull Chain Extension20 x ConnectorsNotice:This Item Is 3.2 Mm Bead Chain; Please Make Sure The Replacement Diameter Of Ball Size Pull Chain When You Buy It.Small Parts, Please Keep Away From Child. Magnificent Crystal is made from Finest Material, Great Clarity and Luminous, Colorful and sparkle Magnificent Crystal is guaranteed to never change its sheen or color and contain absolutely no blurs, bubbles or streaks. 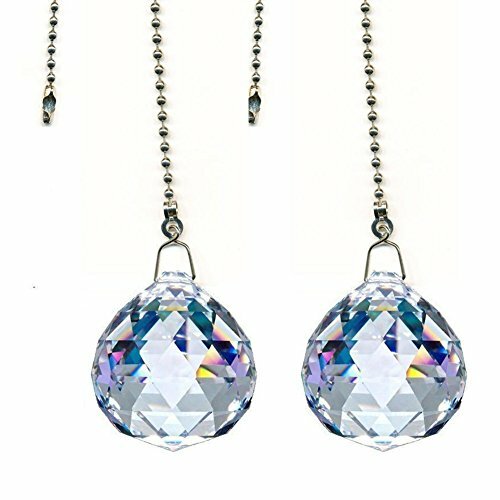 It will never change its spectrum of light and colors which remain luminous and radiant for life Look for Magnificent Crystal Label which differentiates the piece from mass market products to ensure purchasing reliable crystal Use this pull chain to add beautiful colors and good energy to your space. it sparkles and shines in the sun, reflecting the colors of the rainbow. This pull chain is a great addition to ceiling fans, lamps and lighting fixtures. 7" Silver chain included. You can easily attach it to the existing chain from your fan. Simply cut chain with scissors to desired length if you need to change the size. Specifications: Material: Metal. Color: Silver. 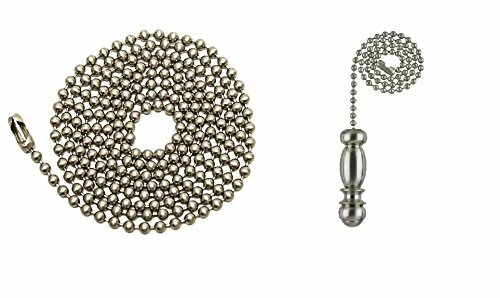 Size: beads' diameter 3.2 mm/ 1/ 8 Inch, Chain Long 20 Feet/ 6 Meter, With 20 Pcs Matching Connectors. 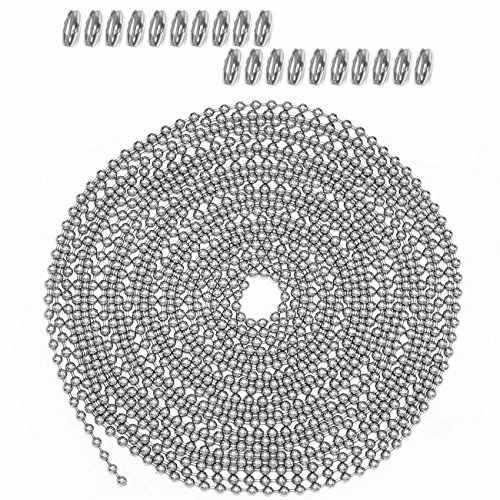 Deatils: The 20 feet/ 6 meter long chain has a bead diameter of 3.2 mm/ 1/ 8 inch, #6 size. Apply 20 matching connectors attached to form handle or extend chain. 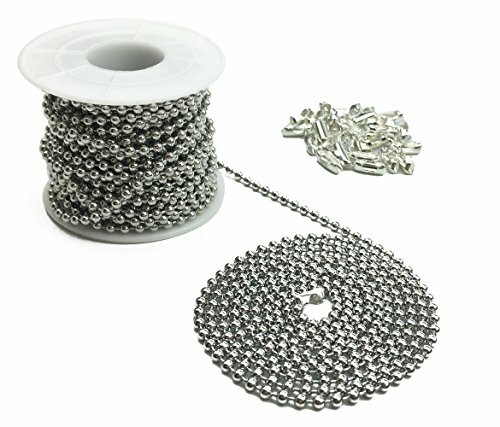 Package Includes: 1 x 20 Feet Silver Pull Chain Extension. 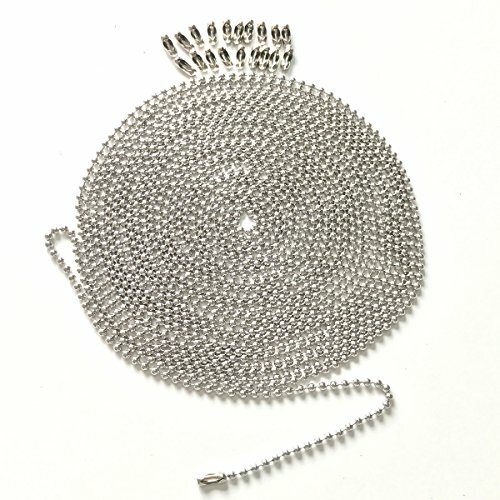 20 x Connectors Notice: Our item is 3.2mm bead chain; please Please check your replacement diameter of balls size before you buy it. Small parts, please keep away from child. 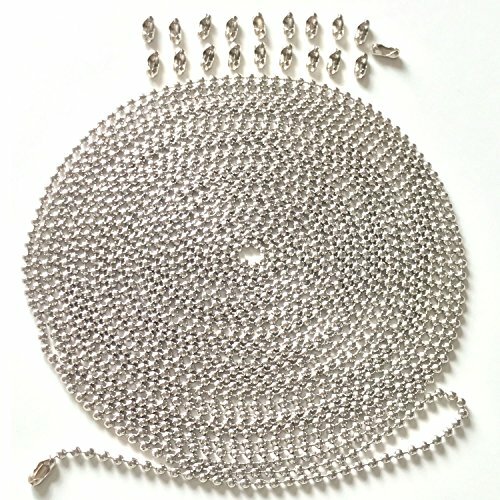 Compare prices on Beaded Ceiling Fan Chain at ShopPlanetUp.com – use promo codes and coupons for best offers and deals. We work hard to get you amazing deals and collect all available offers online and represent it in one place for the customers. Now our visitors can leverage benefits of big brands and heavy discounts available for that day and for famous brands.